As a Trane dealer, we’re committed to being the best in every aspect of our business: installation, service, employee training and customer satisfaction. 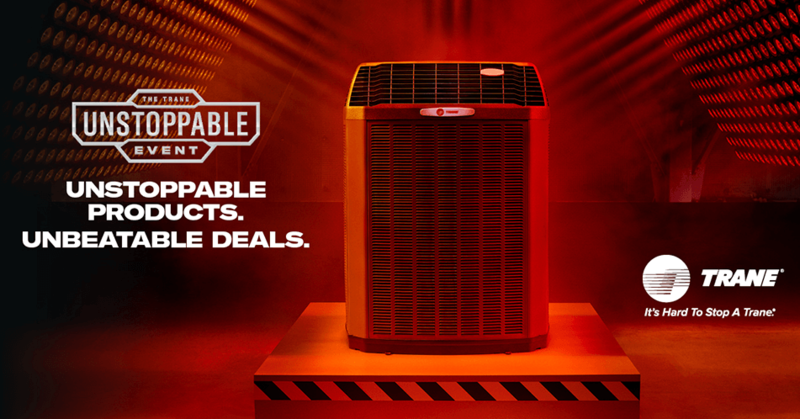 Every Trane air conditioner we install is backed by our 30-day 100% Satisfaction Guarantee. If you’re not happy with your new air conditioner within the first 30 days, we will remove the equipment and refund your money. Trane offers a wide variety of systems to fit your needs and pocketbook. 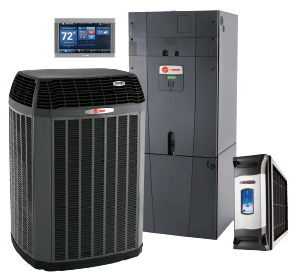 We offer everything from our “Value Line” to the state of the art “Tru Comfort Systems” that demonstrates why “It’s Hard to Stop a Trane” and is unrivaled in the industry for comfort, reliability and efficiency. All of our systems carry a full 10 year warranty. Trane’s Hyperion system once again sets it apart from its competition with a composite air handler cabinet that won’t corrode — ever. The all aluminum air coil is substantially more durable than conventional copper coils and is not subject to “formicary corrosion” that is plaguing many manufacturers in the hot, humid climate of Southwest Florida. Trane’s exclusive variable speed fan motor provides superior humidity control over single speed fans. It comes on at reduced speed for approximately 10 minutes prior to ramping up to full speed. As the air passes over the cooling coil at a slower speed it removes more humidity than if is running full speed. 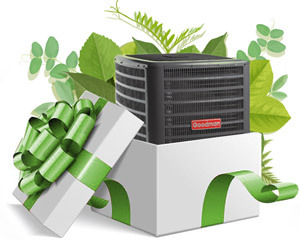 The “Hyperion” air handler coupled with Trane’s superior condenser construction demonstrates why “It’s Hard to Stop a Trane.” The Climatuff compressor is the most reliable ever built and the all aluminum “Spine Fin Coil” eliminates galvanic corrosion of dissimilar metals common in most air conditioners which reduces efficiency over time. The “DuraTuff” composite base will never rust and all fasteners are zinc coated to resist corrosion and rust. All of these features are especially important in Southwest Florida’s extremely humid climate, with Efficiency ratings as high a 20 SEER the Trane system is the logical choice for most full time residents. Our service area includes Fort Myers, Naples, Bonita Springs, Estero, Cape Coral and more. See our full service area. Please fill out the form below and our friendly staff will contact you shortly to schedule you for a free, no obligation AC replacement assessment and written quote.